It's been who knows how long since I've dyed Easter eggs. It's been many many years. 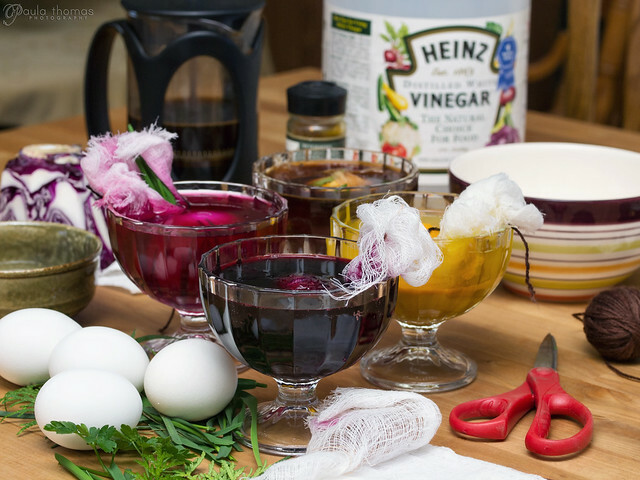 I've always used what most people color eggs with, food coloring and vinegar. I thought I'd try something a little different this year. I did use vinegar but instead of food coloring I used some natural and safe ingredients. Dark Blue/Purple: Simmer 3/4 Cup blueberries in 1/2 cup of water and 1/4 cup of vinegar for 10-15 minutes. Crush blueberries with a potato masher to release all the juices. Cool and strain liquid into small bowl or jar. Yellow: Simmer 1/2 Cup of water and 1/4 Cup of vinegar with 2 tbs turmeric for 10 minutes. Pour into small bowl or jar. Light Blue: Simmer 1 Cup chopped red cabbage in 1/2 cup of water and 1/4 cup of vinegar for 10-15 minutes. Cool and strain liquid into small bowl or jar. Brown: Mix 1 Cup cooled strong coffee with 1/4 cup vinegar in small bowl or jar. Green: Can be done by dipping egg in yellow then blue. I attempted to use plants from around the yard like grass, chives and leaves as a stencil and wrapped the egg in cheese cloth before dipping. It didn't work out quite the way I had hoped. The grass didn't come out too bad but the other things were a little too stiff and didn't stick to the egg very well so the dye got around it. I also wrapped some of the eggs in rubber bands and those turned out pretty well. The rubber band was tight and didn't move. If you want to try doing a stencil using leaves or grass, make sure the leaf is very flexible and will stick well to the egg without leaving any space. You can wet the leaf to help it stick. Wrap the egg with cheese cloth if you are using a leaf and tie the end together with a string or rubber band. You can also put rubber bands around the egg if you want to add white lines. 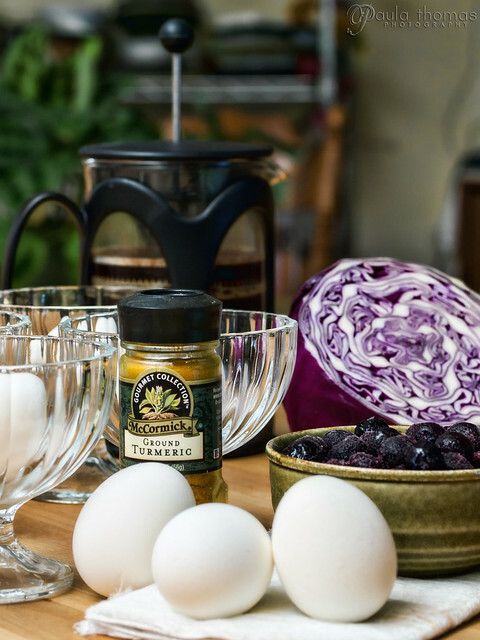 Dip the eggs in your jar or bowl. The egg should be completely submerged. 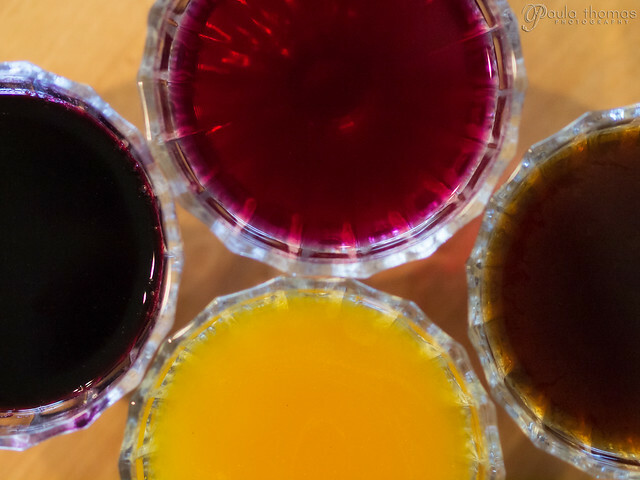 If it's not you can add a little more vinegar or color solution if you have extra. Be sure to check on them every once in a while. If the cheese cloth is draped over the bowl/jar it may start dripping onto whatever surface you have it on. It might be a good idea to set them on plates to avoid a big mess. 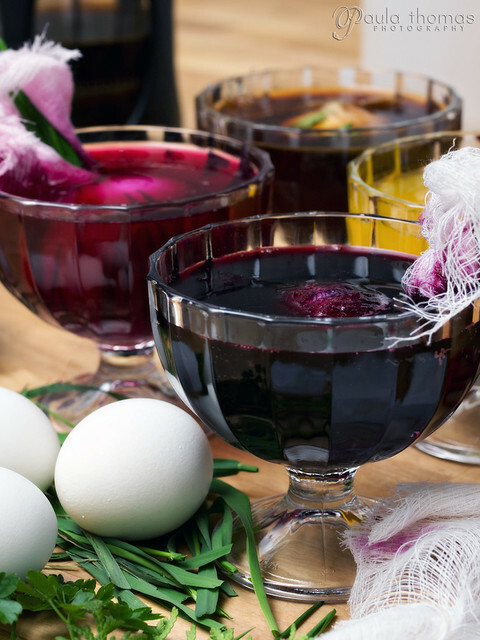 I let my eggs soak for an hour or two for darker coloring but you can test it out and soak for less. I'm pretty happy with the way all the colors came out. I did make the mistake of rinsing some of them in water to get off the excess color which turned out to be a bad idea because it ripped off some of the color. This was such a success that I don't think I will ever go back to using food coloring for dying eggs again. They came out great! The purple cabbage sounds like it would make all sorts of pretty shades. 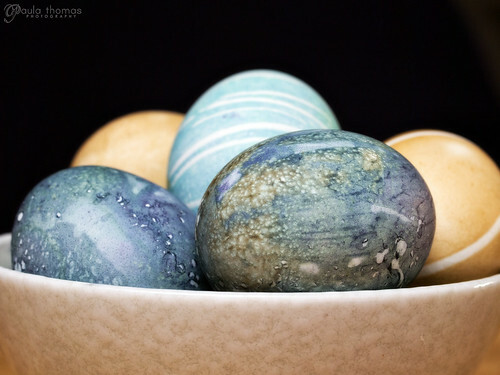 We dyed eggs with onion skins a while back. They get kind of a pretty sepia color in different shades. 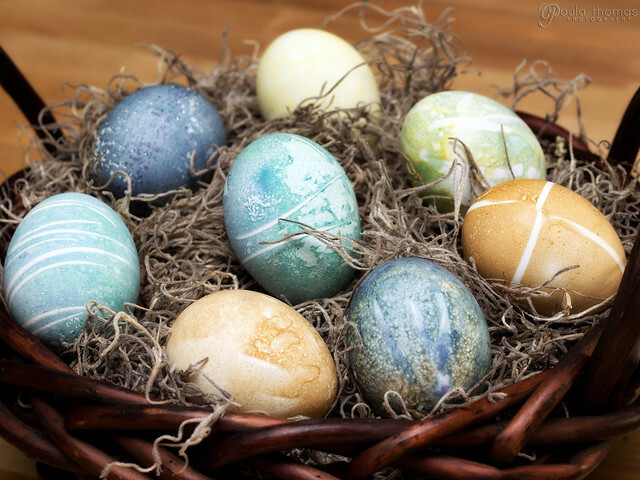 I wonder if you could combine the Pysanky (melted wax decoration) technique with natural dyes?